Casa Clotilde is an Independent Villa in a typical well-finished country Tuscan style with terracotta tiles and wooden floors. The two-storied house has 150 sq m of living space and it can fit up to 8 people, there are 4 double bedrooms, 3 bathrooms with shower and 2 kitchens, on the ground floor there is an open plan kitchen/sitting room and a fireplace, on the first floor is located the second one. The apartment “le Terrazze” is a part of the house, it is furnished in a typical Tuscan style with terracotta tiles and wooden floors. It is a two-storied apartment of 100 sq m of living space and it fits up to 5/6 people. It has 3 bedrooms, one double with a balcony, the second double and the third with a single bed and a sofa bed. 3 bathrooms and an open plan kitchen/sitting room on the ground floor. The Agriturismo has 2 swimming pools one for the guests of Villa Clotilde and one for those who stay in the apartment “le Terrazze”. From both of them you will enjoy a beautiful view over the valley. There is also a stone barbecue and a gazebo in the garden for guests summer dinners. 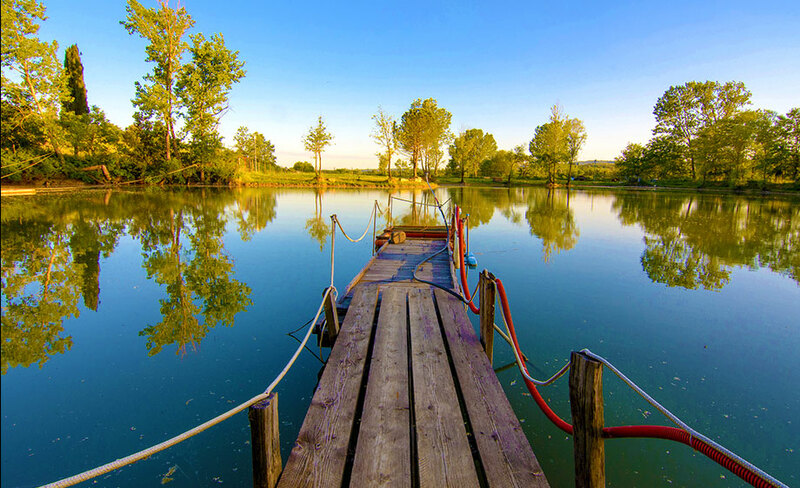 It is also possible book for dinners with typical Tuscan products or fish in our private lake. 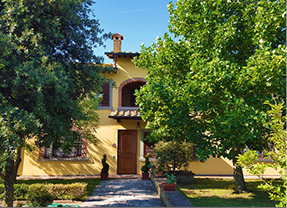 The Agriturismo is not too far from Florence, Siena and the Chianti area. Dinners with typical Tuscan products: you can book the dinner to us. Spa: few kilometres far from our agriturismo there is Rapolano a small town where you will find 2 spas “l’AnticaQuerciolaia” and “ Le Terme di San Giovanni”. Cities of Arts: guests can visit the famous cities of Tuscany: the beautiful Florence with Ponte Vecchio and Uffizi Museum, Siena with Piazza del Campo, San Gimignano which has beautiful historic towers, Pienza and its delicious cheese and BagniVignoni with its medieval thermal bath. Wine Tour: it is possible to taste the famous Tuscan wines like Nobile di Montepulciano, Brunello di Montalcino in the beautiful landscape of Chianti, between Siena and Florence or try Chianti Classico Gallo Nero visiting the towns of Greve in Chianti and Panzano. Agriturismo Le Terrazze is located in the hills of Civitella in val di Chiana Valley in Arezzo, Tuscany near Monte San Savino. It is entirely surrounded by the countryside and has a beautiful view over the near valley. We have 2 kinds of accommodation: an independent villa with private swimming pool and an apartment with a second private swimming pool. 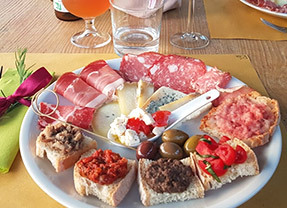 The Agriturismo has a perfect position to know Tuscany, to visit cities of arts like Florence and Siena, enjoy beautiful views over Chianti Valley and taste famous and very good local wines like Brunello di Montalcino and Nobile di Montepulciano. Guests can visit medieval and historical cities like San Gimignano, Pienza where you can taste its famous cheese, Montepulciano, Montalcino and the ancient spa of Bagno Vignoni.